of Goldsmith Place, and 210 Sherwood Street, Nottingham. Later moved to Goldsmith Place and St. James Street, Nottingham. 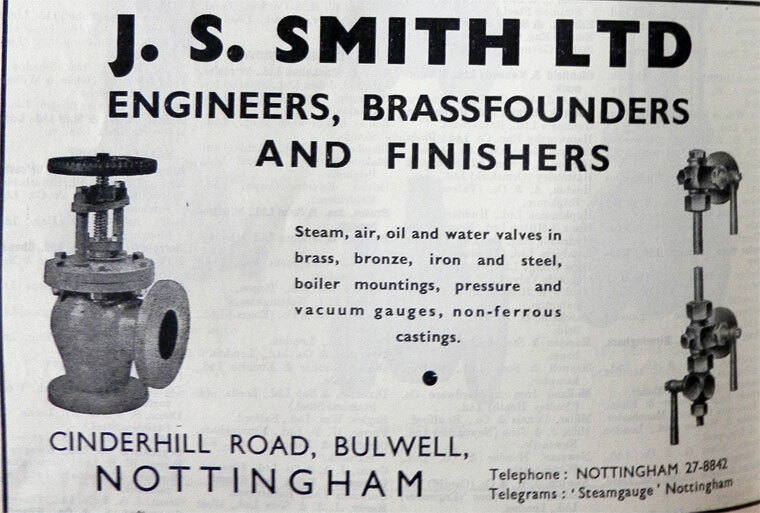 1948 Under the management of Reginald Smith, Chairman, and Peter Smith, Managing Director, the Company purchased land and works on Cinderhill Road, Bulwell, Nottingham and moved from Goldsmith Place, and also later from St. James Street to this works, which had been fitted with all the necessary machinery for making the numerous valves and fittings required for the home and export markets. 1965 Peter Smith, Joseph Samuel’s grandson, sold the business to the Bells Asbestos and Engineering Group and continued as Managing Director.